If you want to visit California in March, you picked a good month. During the lull between winter and spring break, the weather is often delightful, and the skies are mostly clear. Crowds are low, and you can enjoy major attractions without feeling crowded. You may also get hotel rooms at a reasonable price, especially in the first part of the month. But look out for spring break. When families and college students take advantage of a break from the classroom, you'll find crowds at all the major attractions. In a state with as much geographic diversity as California, your packing list will vary depending on where you go and what you're doing. These are a few things to keep in mind. In March, water and air temperatures at the beach limit most people to oceanside strolls. The beach areas are always colder than inland, and they get even chillier when the sun goes down. If you plan to spend time outdoors camping or hiking, pack layers to stay warm and covered, and in case it's colder than expected, take a couple of extras. It takes a lot of things going right to get a spectacular wildflower bloom. If there's been winter rain, things are off to a good start. But it's not enough — weeds can start growing too soon and choke the sprouting flowers before they can get a good start — or rain can come too early or too late. Unfortunately, the wildflowers bloom according to weather conditions and not the date on the calendar. And despite whatever hype you may have seen, they don't put on an exuberant show every year. The California Wildflower Guide will give you some resources to track the current year's conditions. Daffodil Hill, Sutter Creek: During mid-March and early April, this gold rush era ranch explodes with over 300,000 daffodil blooms. Blossom Trail, Fresno: In California's central valley near Fresno, you can take a drive on the blossom trail through miles of orchards filled with pink and white blooms. 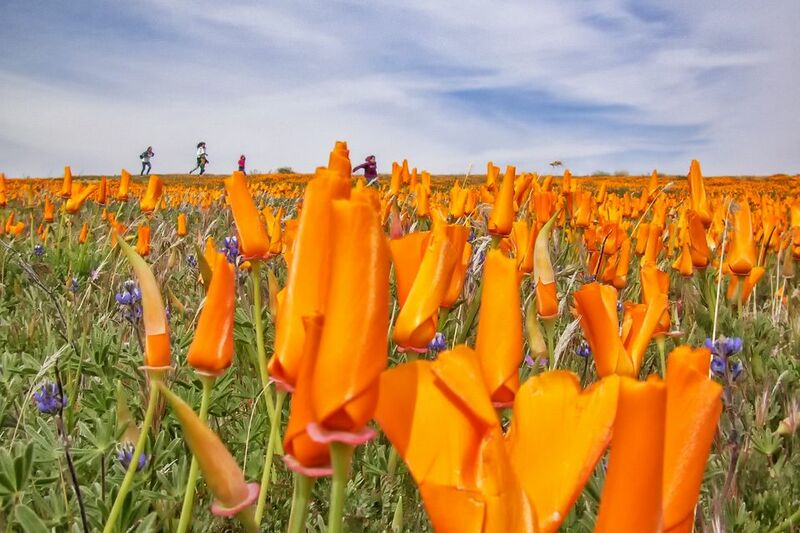 Poppies in bloom, Antelope Valley: It can be decades between the best bloom seasons in Antelope Valley near Los Angeles, but when the conditions are right, the landscape erupts in orange-colored California poppies. The St. Patrick's Day Parade in San Francisco is only part of the fun. There's also a festival held at Civic Center Plaza. St. Patrick's Day in Los Angeles includes festivals, a drinking marathon, music performances, and pub crawls. Saint Patrick's Day Parade in San Diego: They're not the only people in California celebrating, but their parade is one of the liveliest. Once in a while, a couple of lunar holidays fall in March. In 2019, Easter falls on April 21, but that makes the last weekend of March the time to plan for it. These are a few other travel-worthy events that happen in California in March. Cinequest Film Festival, San Jose: Cinequest is the first big film festival after the Academy Awards and one of the best film fests in the state. They host an impressive number of movies and get some wonderful guests, too. It starts in February and usually extends into early March. Swallows Return, Mission San Juan Capistrano: It's a surprising thing, but every year the swallows return to Mission San Juan Capistrano on March 19, St. Joseph's Day, after flying from their winter home in Argentina. Get information about the celebrations at the mission website. California Spiny Lobster season ends in the middle of March. They don't have the big claws like Maine lobsters but are sweeter than their East Coast counterparts. You may find them on the menu in southern California restaurants, but get 'em quick or wait until next September. Whale Watching in March: This is a good time off the California coast to see gray whales. Chinese New Year is a lunar holiday. San Francisco's big Chinese New Year Parade is always on the weekend and occasionally doesn't happen until early March. If you want to go camping at a California state park in March, make your reservations six months ahead of time in September. Everything you need to know is about California State Park reservations is here. If you're planning to camp at Yosemite between February 15 and March 14, be ready at 7:00 a.m. Pacific Time on November 15 to make your reservations. For March 15 through April 14, reserve on December 15. You can do that online or by phone at 877-444-6777 or 518-885-3639 from outside the US & Canada. Get an overview and more options here. If you're going to California in March and want to see wildflowers in bloom, you can make your reservations and hope for the best — but also be prepared for disappointment. Mother Nature may or may not cooperate by providing them during your travel dates. Don't miss the Chinese New Year Parade because you didn't know the right date. Check the Chinese New Year Parade guide to get more information.